Jackie has been teaching stained glass courses for fourteen years – evening classes, short courses and workshops, for all ages. She has worked with schools, youth groups and community groups as part of college and museum outreach work as well as for specific projects. She has also taught courses at Leeds College of Art, Craven College, Skipton and the Centre for Creative Arts, Weymouth College, Dorset. Jackie is always ready to discuss opportunities for further courses and venues. All courses are suitable for beginners – no experience is necessary. Small groups ensure personal attention. Those who wish to further their skills may also join these courses, sign up for Intermediate courses or could enquire about purpose-made courses focussing on specific requirements. Jackie also runs ‘Workshop Days’ for students wishing to do their own work with some guidance. All tools and materials are provided for the courses; if there is a charge for materials then this will be made clear at the time of booking. 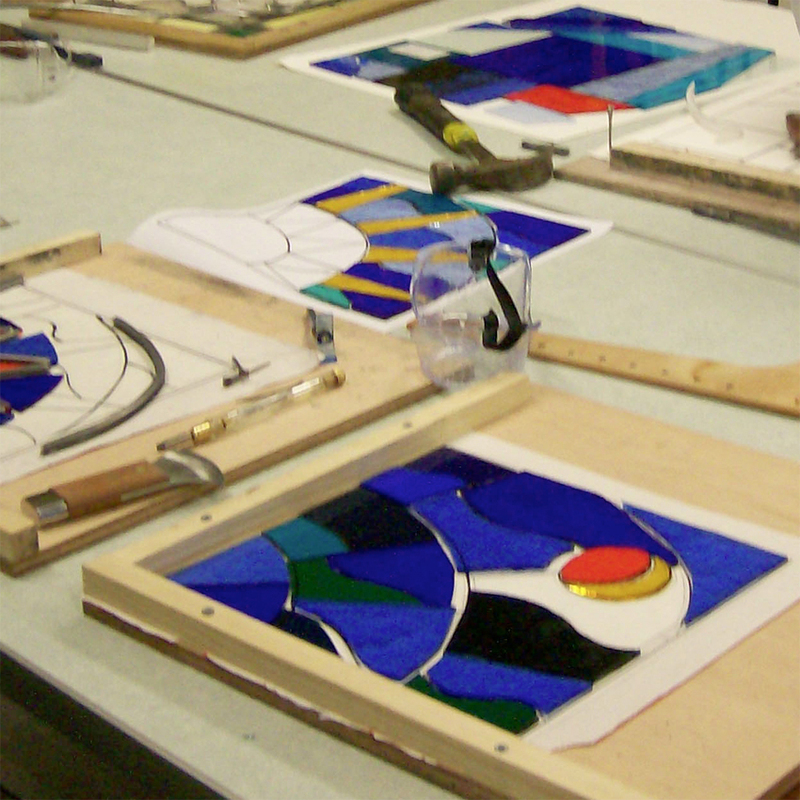 Stained glass courses: Dorset, Somerset, Cumbria, Yorkshire. This course involves the design and making of a small leaded light panel (up to about A4 size), using coloured glass and traditional lead came. You will be guided through the different stages of making the panel from the initial design, through cutting the glass, fitting the glass and lead together and soldering the lead. Everyone will take home a finished product. 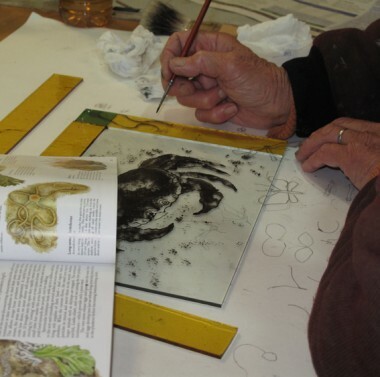 This course allows you to explore the use of traditional pigments fired onto the glass in a kiln, as a way of enhancing your design. There will be a chance to try different methods of applying the paint to the glass and the use of ‘silver stain’ – all ways of manipulating the light levels and colours in a window. You may choose to make your painted pieces to suit a small panel or keep them as a series of ‘tiles’. This is a technique to join pieces of glass with copper foil strips and solder. We will be making small ‘light-catcher’ hangings and mirrors. You will learn to cut glass to a pattern, join and solder the pieces together. Depending on how fast you work in the day you may take home several hangings. By using a microwave kiln we can fuse small pieces of glass much more quickly than in a conventional kiln. There will be an opportunity to cut and assemble small pieces of glass to fuse in this kiln during the day – pieces for jewellery or insets for stained glass panels. You may wish to combine this course with a follow-up stained glass panel course so that you can use your glass pieces in a panel. On this course we will use a pre-cut piece of mirror as a focus for a decorative stained glass surround – using coloured glass and lead. In one day you will be able to create a beautiful decorated mirror to your own design to hang at home.